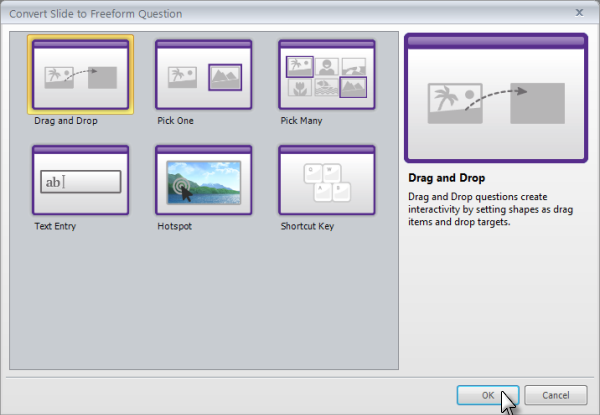 The Convert to Freeform option allows you to quickly turn any content on your slide into a freeform question or interaction. For example, you can insert some images, characters, shapes, or any other objects onto your slide and then convert them to a drag-and-drop interactivity, a graphical multiple-choice, or any of several other forms of interactions. While in Normal View, click the Insert tab. When the following window appears, choose one of the options on the left and click OK.
Once you're finished setting up your question or interaction, click Save & Close to return to the Normal View of your slide. Need to Make Edits Later? You can always go back and change your preferences for the way your freeform question behaves. Just go to the slide that contains the freeform question, find the Question panel in the upper-right of your slide workspace, and click the Edit button that appears there. This opens the question editor, where you can make whatever changes you like. Select Remove Freeform from the Storyline ribbon. Storyline will prompt you to make sure you really want to remove the interactivity from the slide. Click OK if you do. Any elements you had inserted onto your slide will stay there, but the interactivity will be removed. 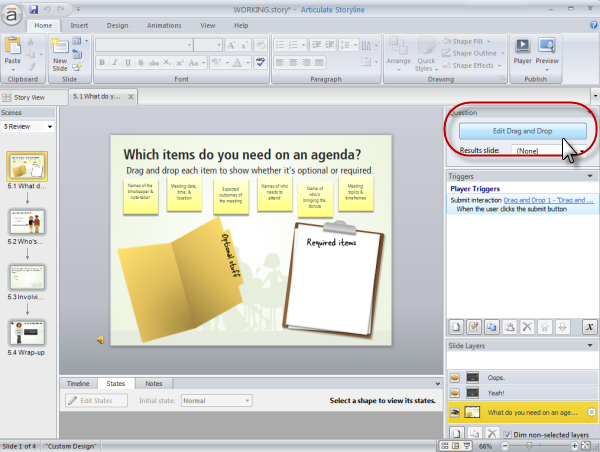 So will any slide layers that Storyline previously created for question feedback.